Many of Anomet's customers require medical grade stainless steel with a layer of radiopacity to improve visibility under flouroscopy. Anomet Products solved this challenge by designing 300 Series Stainless Steel with either a core or cladding layer of a radiopaque alloy such as platinum, gold or tantalum. The wire exhibits the same properties of stainless steel while also improving its density. Other benefits of this composite clad wire combination are solderability and conductivity enhancement. Alternative 300 Series Stainless Steel is also available upon request. Precious metal-clad wire and ribbon are a cost effective alternative to solid wire while offering greater ductility and formabilty than filled or plated wire. 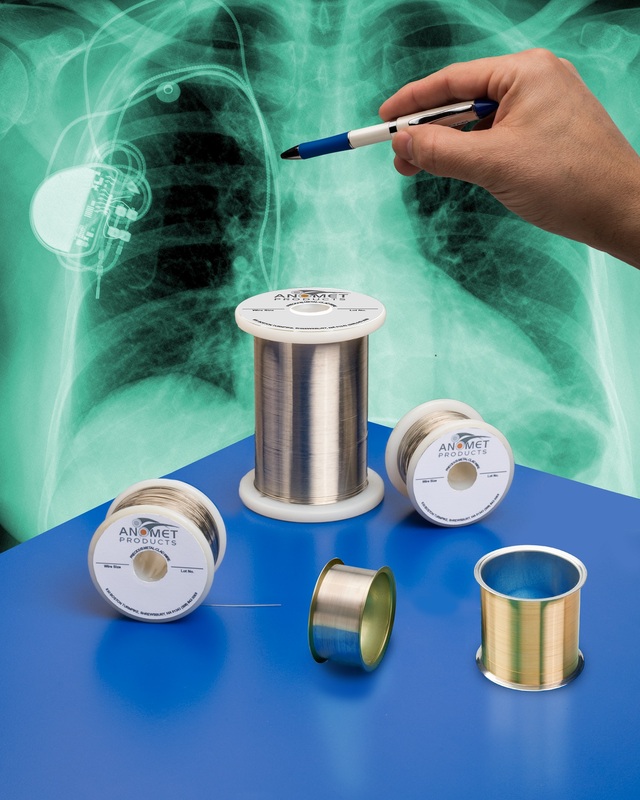 Anomet's clad-wire features a complete metallurgical bond between layers making it the wire of choice for many medical device manufacturers when it comes to high reliability. No other clad metal wire manufacturer offers the flexibility of alloy choices along with the ability to vary the clad layer thicknesses as Anomet Products can with our unique cladding process. Anomet's wire is manufactured using various heat, pressure and reduction techniques. Draw on Anomet's 40 years of clad-wire experience to engineer the perfect solution to your wire challenge. To meet specific requirements, Anomet's clad-metal wire can include precious metal cores or claddings such as platinum for oxidation-corrosion resistance and biocompatibility, gold for contact resistance, tantalum for radiopacity under fluoroscopy, and silver or conductivity. Each alloy can be clad to core materials such as copper (Cu) or copper alloys, niobium (Nb), molybdenum (Mo), MP35N® and Ni-Co-Cr-Mo Alloys, Nitinol (NiTi) and Nickel-Titanium Alloys, Platinum (Pt) alloys or Platinum-Iridium (Pt-Ir), Silver (Ag), stainless steel (302, 304V, 316LVM, etc...), tantalum (Ta) or tantalum-tungsten (Ta-W) alloys, and titanium (Ti) or Titanium alloys. Anomet's Precious Metal Clad Wire can be designed using any combination of the metals and alloys below. Although these are some of the more common alloys our customers are using today, you can also specifiy your own. Examples of our wire used in various medical devices are Pt Clad Ta, Au Clad NiTi, Ta Cored 316L, Au Clad Ta, Ag Cored MP35N, Pt-Ir Clad Titanium, Pt/MP35N/Ta, Ta Clad NiTi, Au/Ta/BeCu, Pt Clad Ta w/Ti Core, Pt cored NiTi, Pt Clad NiTi. COMBINE TWO OR MORE OF THE FOLLOWING METALS OR ALLOYS INTO A CLAD METAL WIRE "SYSTEM" THAT ACTS AS ONE. For over 30 years, Anomet Products has been designing and manufacturing clad metal wire used in medical devices throughout the world. As a leader in clad composite wire for the medical device industry, our team of highly skilled experienced material engineers has been on the leading edge of many of the following areas during this time. If you know the clad metal composite wire design you need, send us an RFQ with the following details. If you are unsure of the materials you require, feel free to contact one of our sales engineers for immediate assistance.